Tag Archive | "Estoril Open"
The last time Juan Martin Del Potro competed on clay, he was battling Roger Federer in the 2009 French Open semifinals. Del Potro demonstrated that he can be a threat on this surface in Paris this year. The Argentine annihilated Fernando Verdasco 6-2, 6-2 for his second title of the season. After failing to consolidate on an opening service break, Del Potro fabricated double break by forcing a backhand error from Verdasco. With the latter making another miscue, Del Potro went ahead 2-1. 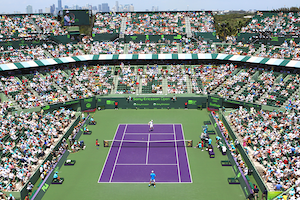 This time, with an ace at 40-0, Del Potro solidified his lead. With Verdasco burying a backhand into the net, Del Potro again had double break point. 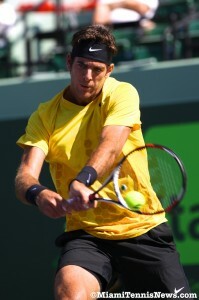 Then, as Verdasco’s forehand flew long, Del Potro broke a third time for a 4-1 lead. By easily guarding serve his next two service games, Del Potro bedded the first set. In the second set, Del Potro’s persistent power proved too much for Verdasco. Thus, as Verdasco’s forehand crosscourt went wide, Del Potro manufactured double break point. Del Potro burned Verdasco with a forehand crosscourt pass winner to break the initial game of the second set. Once more with a comfortable hold, Del Potro moved in front 2-0. The Argentine consistency on serve meant that Verdasco had no break point opportunity.